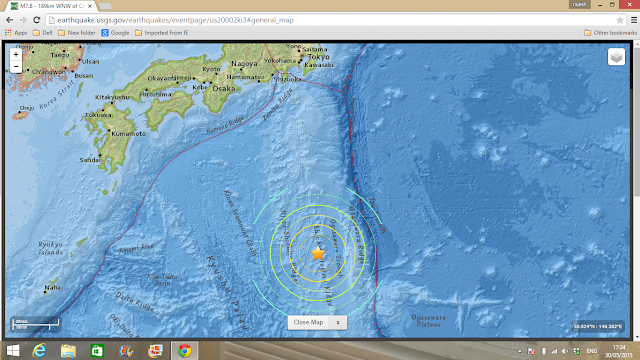 Major Quake ..7.8 On Richter Scale..off Japan near Bonin Islands.. The quake, which hit off Japan's Bonin Islands, reportedly rocked buildings in Tokyo as it built in intensity about 8:30pm local time (9:30pm AEST). The USGS reported the epicentre was approximately 874 kilometres south of Tokyo in the Pacific Ocean. The Japan Meteorological Agency said the earthquake had a magnitude of 8.5 at a depth of 590 kilometres. Tokyo Electric Power Company said there were no abnormalities at the crippled Fukushima nuclear power plant following the quake. The runways at Tokyo's Narita airport were operating normally but the high-speed bullet train service between Tokyo and Osaka was halted due to a power outage, according to public broadcaster NHK.